As part of our continued emphasis on merging the academic and professional worlds, we regularly welcome a number of external guest lecturers. We firmly believe that hearing new voices from outside the university provides students with different points of view, as well as an important introduction to roles which our students are working towards. 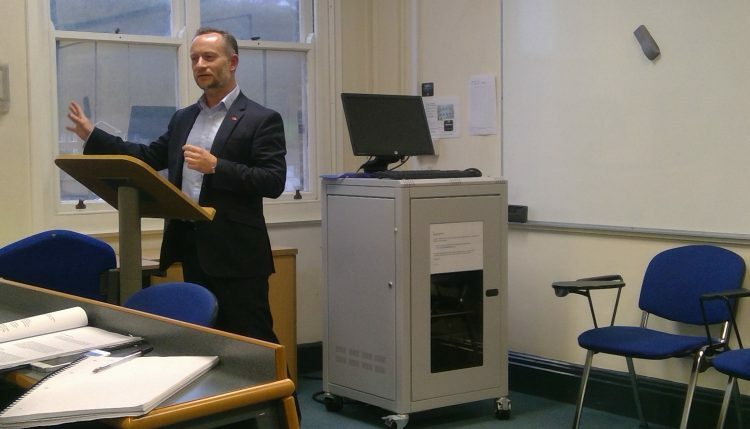 Recently our Law students received a lecture from David Daniell, who provided insight his role as an in-house Commercial Lawyer for Aerospace, Defence and Transportation organisation, Thales. With over 14 years of in-house and private practice experience, David offered our students a positive and realistic view on aspects of his day-to-day life as a Commercial Lawyer. David referenced the typical areas of law covered, the cultures of different stakeholders he works with and their expectations in a technology company. David also covered how business is done from bids, to in-contract performance and touched on disputes, as well as his own journey to becoming a Commercial Lawyer. Our students found this talk both @useful and inspiring and have written the following article on our Law students’ blog, detailing David’s talk. Tagged Careers, Industry, Law. Law with Business. Bookmark the permalink.